It’s Thursday! Exciting, right? It means tomorrow is Friday and then it’s the weekend. I’m pretty sure I’ll be working and cleaning our house, but maybe I’ll get to sleep in. And maybe we’ll even head out to the local ski trails and go snowshoeing again. But back to it being Thursday. Thursday also means a new Maker’s Mix-Up and GUYS! I am so excited about today’s post. 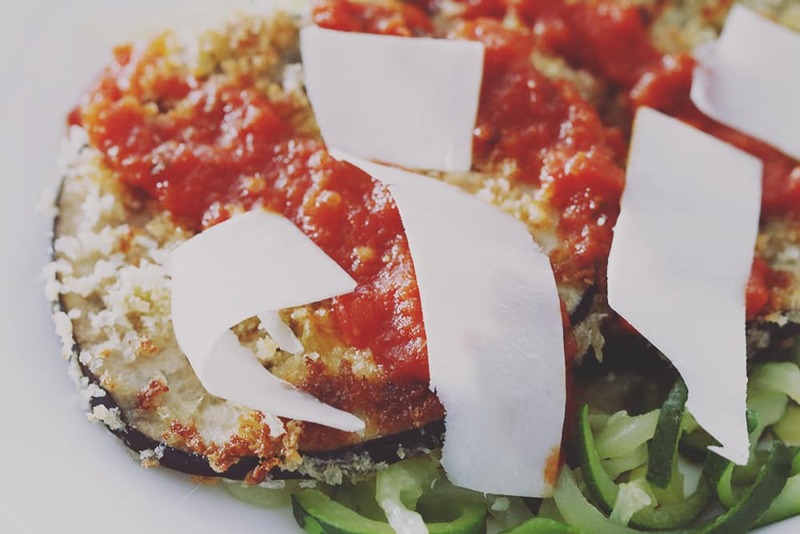 And this eggplant parmesan with zucchini noodles recipe. This meal was ah-mazing. Like, eat it five times in a week amazing. Seriously. And it’s (mostly) healthy. Which made me just want to eat it over, and over, and over, and over again. Swoon. Just looking at the pictures make me want to go back and remake the entire dish again. Because it’s so easy. And so good! Did I mention how amazing it was yet? I’m sure I did, but I don’t think I can convey just how good it is. Obviously that means you need to make it. This week’s theme for the Maker’s Mix-Up: HEALTHY! 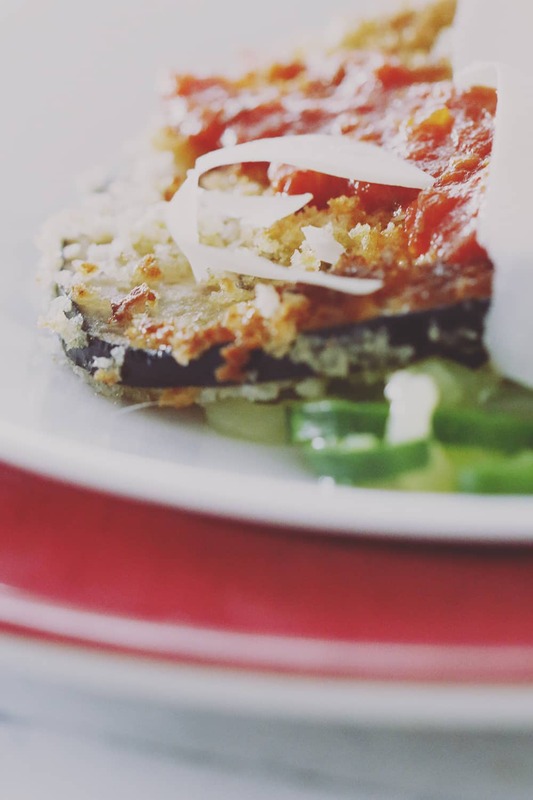 Which is why this eggplant parmesan with zucchini dish is so fantastic. It’s vegetable packed, light on the back for you stuff (is it really bad for you though? It tastes so good so maybe it’s just… not as good for you. We’ll go with that!) and it’s super light. And for me, that’s key. Nathan loves Italian. Much to his dismay, I do not. I cannot stand heavy meals. I love to eat, but I just cannot stomach the meals that leave me feeling like I’m Violet from Willy Wonka. And a lot of Italian food that I like feels that way. Not even a slight resemblance to heaviness unless you count how much eggplant I’d pile on my plate. Heat 1 tbsp oil in a pan over medium heat. Beat the eggs in a shallow dish. Combine the garlic salt and breadcrumbs in a separate shallow dish. Slice eggplant to approximately 1/8" slices. Coat the eggplant in the eggs and then cover in the breadcrumbs. Place in the pan and cook for 3 minutes per side, or until each side has started to lightly brown. Repeat with all slices. While cooking the the eggplant, spiralize the zucchini according to the machine's instructions. Boil enough water to cover the zucchini noodles and drop them in. Boil for 5 minutes. 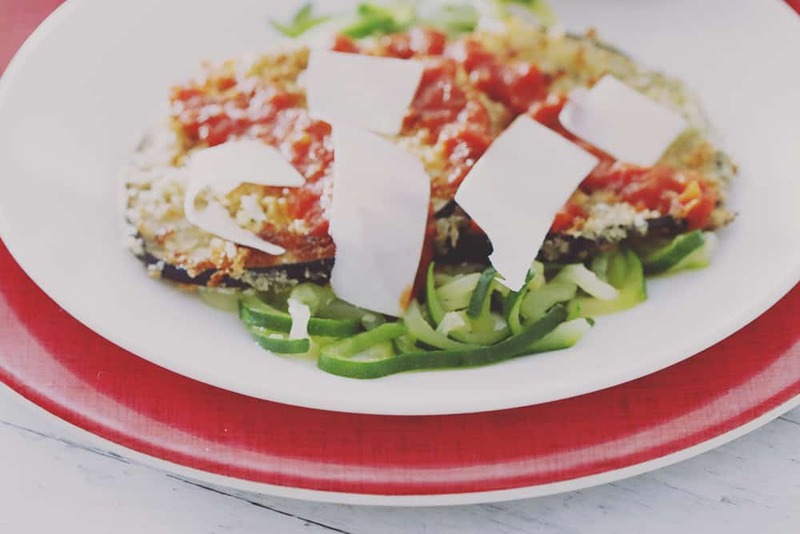 Serve the eggplant slices on top of the zucchini noodles, top with sauce and parmesan cheese if desired. See? SO easy! And if I haven’t convinced you to indulge in this vegetable heavy dish on taste alone, eggplants are crazy good for you! Fiber and vitamin packed, they’re also great for cardiovascular health and filled with antioxidant compounds. Good tasting food that is good for you = double win! But now I want to see your healthy DIYs or recipes! 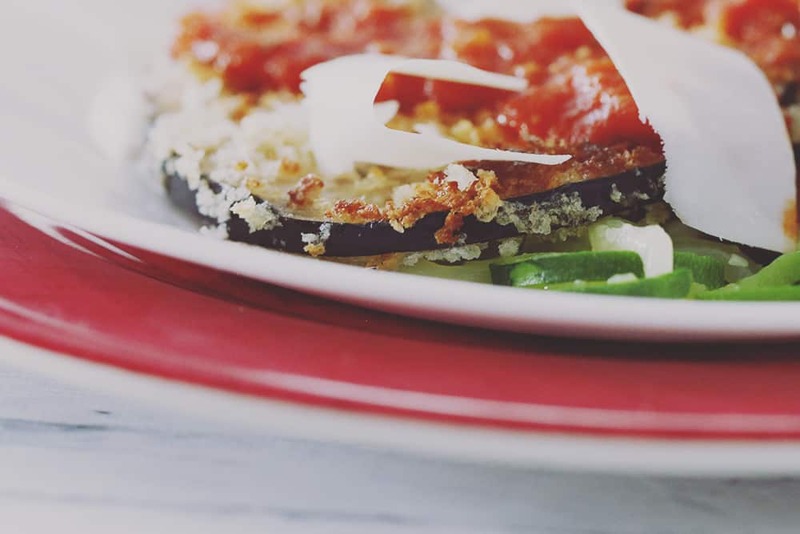 This looks delicious, I love eggplant parmesan and this recipe looks easy enough for me to try and make. Well that sure is interesting. I’ve never had a “pasta” made out of a vegetable before. I would love to try this but I know my husband would give me the stink eye over the lack of meat. Ooh this dish looks great and I love what you did with the zucchini. This would be an awesome meal for my daughter and I. This looks scrumptious! I would love to try this for dinner tonight. This looks super delish! I’ll definitely have to remember this when we have our fresh garden zucchini this summer! Thanks, Hannah! I can’t wait to do the same this Summer! I’ve been seeing spiralized zucchini everywhere lately and this looks delicious! I need to get the attachment for my KitchenAid. I’d love to make this. Love your dish! I’ve been trying to use more veggies and make healthier meals for us! Can’t wait to try it! Thank you, Claudia! It’s a great way to get some extra veggies in. This eggplant parmesan with spiralized zucchini noodles sounds so good. We here love zucchini and eggplant so this would be perfect for use. I will have to try this recipe. I love eggplant and this looks so delicious! I have to give this a try. That looks DELICIOUS. I haven’t ever tried spiralized zucchini before but I really want to. This looks like a dish that would be perfect to give it a try. I got a spiralizer for Christmas and I love it. I love making the zucchini noodles. This is a great recipe. I will be trying this out for sure. Thanks. Aren’t spiralizers great, Alexandria?! We love ours! This looks so delicious! I have eaten zucchini noodles but I haven’t introduced them to my kids…I need to! Thanks, Briton! I hope your kids love them if you do! That always seems to be the case when I’m browsing recipes ;) Thanks so much for the comment, Ana! I’ve never had eggplant, but boy this sounds amazing! I need to try it. This looks awesome! I love zucchini, but I’ve never had eggplant parmesan. I could eat eggplant all the time! Zucchini, too! I definitely need to get my hands on a new spiralizer (my old one was terrible and I got rid of it) so I can make this dish soon! Me too! I love our spiralizer – we’ve spiralized SO many things that are probably pretty unnecessary, haha. But having a good one makes a huge difference! Yummm… it looks delicious! I will follow mentioned instructions to make this recipe in my kitchen too!! Thanks so much :) Hope you love it, Jasmine! That eggplant looks simply perfect – Thanks for sharing at the What’s for Dinner party!